We Want Miles at La Cité de la Musique in Paris was packed when we visited it recently. Those are some of the graphics above and the multimedia Miles memorobilia was certainly stunning, but the average age of those packing into the exhibition was even more stunning. There are not many countries where you see young people paying 8 euros (11 US dollars) to queue for a celebration of a jazz musician who died before some of them were born. That is French bebop pianist René Urtreger above, and I was particularly pleased to find an extended video interview with him as one of the We Want Miles exhibits. 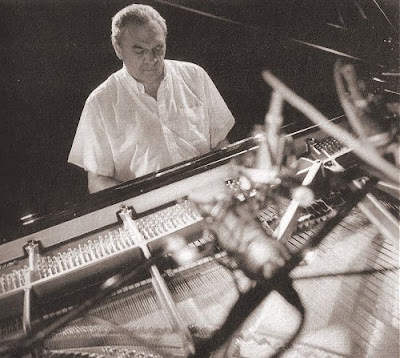 René Urtreger studied classical piano before making his reputation in the famous Club Saint-Germain on Paris' Left Bank with his Bud Powell influenced style. 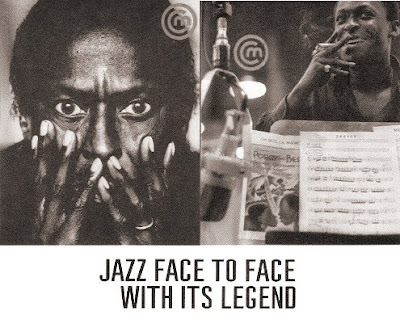 He has played with many jazz greats including Miles Davis, and recorded the the soundtrack to Louis Malle's film Ascenseur pour l'échafaud (Elevator to the Gallows) with Miles' band in 1957. 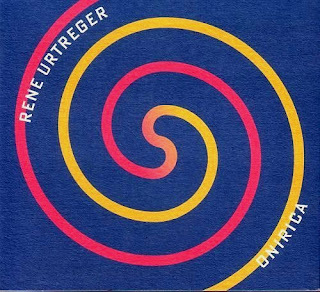 René Urtreger has also worked with many great French jazz musicans, usually as a trio. We saw him do an open-air set at the 2001 Bergerac Music Festival in the Dordogne, that is the ticket below. At the same Festival Kenneth Weiss played the Goldbergs en plein air accompanied by dusk birdsong - I am sure the ghost of Messiaen was lurking in the shadows somewhere. 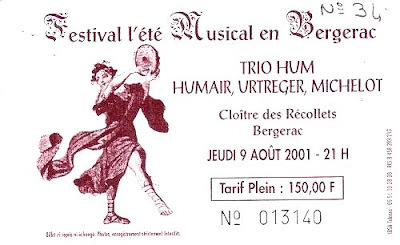 You will see from the ticket that René Urtreger was playing with Pierre Michelot, sadly no longer with us, on bass and Daniel Humair, no mean visual artist, on drums. 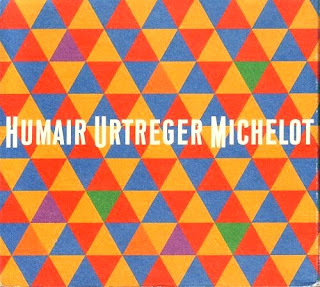 These three consumate musicians comprised the legendary Trio Hum - Humair/Urtreger/Michelot. Below is the beautifully packaged 1999 Sketch triple CD set which brought together Trio Hum's 1960 album recorded live in the Club Saint-Germain and their 1979 and 1999 studio albums complete with original sleeve covers and session photos. Now deleted this HUM tribute is fetching good prices among collectors but mine is not for sale! René Urtreger is living proof that youth is a state of mind, not a time of life. Born in 1934 he is still bebopping and in recent years has released two excellent solo albums. His 2001 album Onirica, seen below, is one of my favourite 'feel good' CDs - superb uplifting jazz piano with no hidden agendas and guaranteed to bring a smile to the face at any time. It was another Sketch release, but is again deleted. Although the Sketch catalogue seems to be decimated René Urtreger is still well represented by Editions Carlyne Music, a French Warner sub-label. If you want to sample some superb jazz piano try their René Urtreger - Jazzman album which is available from Amazon France for 12.45 euros as a disc or 9.99 euros as a download. But the music is a far better advocate than my words. This video from René Urtreger's 75th birthday gig at the Duc des Lombards club in Paris brings you face to face with a true jazz legend.